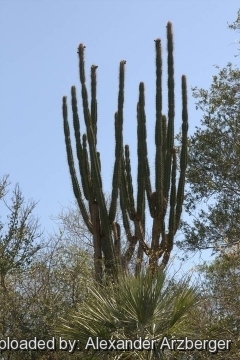 Origin and Habitat: Browningia caineana is known from Bolivia, where it occurs in Cochabamba and Santa Cruz, and from northeastern Paraguay. Altitude range: It occurs at elevations between 100 and 1100 metres above sea level. 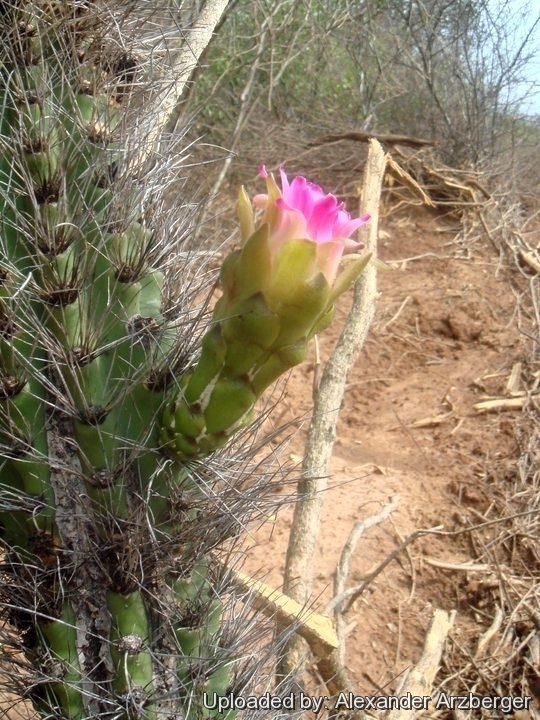 Habitat and Ecology: This cactus grows on sandy soils, in dry thickets that are not suitable for agricultural activities. It grows together with Stetsonia coryne, Cleistocactus baumannii, Monvillea cavendishii, among sparse trees and shrubs covered by Tillandsia and many other epiphytes. Castellanosia caineana is widely distributed, locally abundant, and there are no major threats affecting it. 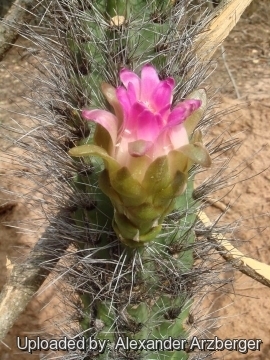 Description: Browningia caineana (Castellanosia caineana) is a treelike cactus, branching basally, to 5-6 m high. The stems are cylindrical with 9 rounded ribs. Flowers develops towards top of branches. Flowers are deep red, diurnal somewhat funnel-shaped. This species differs from Cephalocereus by the full lack of Cephaliums or Pseudocephaliums and even of hair on the flowering areoles. The most striking peculiarity of this species is the heteromorphic spination, with lower part of stems bearing strong spines and apical flowering segments producing only tufts of fine bristles. Derivation of specific name: “caineana” for the occurrence in the valley of the Rio Caine. Stems: Long cylindrical, clearly jointed, somewhat flexible, something bent, grey-green, tapering slightly. Stem segments (joints) 30-40 cm long, 8-11 cm in diameter. Ribs: 9, divided by deep constrictions into sections. Areoles: Circular grey, round, to 3 cm apart. Spines: Noticeably dimorphic, the spines on juvenile (lower, vegetative or sterile portion) of stems are very different looking from those of the upper, flowering portion of stems. Spines of vegetative stems: Brown or black, stout, subulate, but also somewhat aciculate or bristle-like, unequal. Radial spines 15-16, 8-40 mm long. Central spines 3-4, enlarged at the base 4-7 cm long. Spines of flowering stems (in areoles above the fourth constriction): About 25, bristly, flexible of different lengths, white, grey, brown or blackish, 8-40 mm long. Flowers: Purplish red, 3-5 cm long, produced above the the 4(-5) stems constrictions from the middle of the bristle-carrying areoles. Flower buds naked. Ovary and tube with wide overlapping abruptly tapered scales, with dense creamy white felt in their axils. The outer perianth segments are obtuse, the inner broadly lanceolate (Acute) and purple. Anther long and flattened, pale yellow. Style more or less prominent, thick, pink. Stigma-lobes 15 pink white. Fruits: Globose, greenish yellow, to 30 m long, 25 mm thick, slightly tapering towards the dried flower remnant. Scales wide, overlapping like roof tiles, with dense, short and cream felt. Pulp dark yellow toxic. Seeds: small, 1 mm long, reddish brown. 3) Oakley, L. & Pin, A. 2013. Castellanosia caineana. The IUCN Red List of Threatened Species 2013: e.T152348A626692. http://dx.doi.org/10.2305/IUCN.UK.2013-1.RLTS.T152348A626692.en. Downloaded on 10 July 2016. Cultivation and Propagation: Browningia caineana (Castellanosia caineana) is a species which seems to be very rare in cultivation. Hardiness: They need to be kept in a cool place during winter rest and are somewhat resistant to frost if kept on the dry side prior to, and during, cold weather with little danger of being killed (unlike most of the Pilosocereus species). In cultivation it is better not to expose it to temperatures lower than 5° C, even if in an aerated and protected location. In the rest period no high atmospheric humidity! !